Wolves And Horses is a solo project by Christian Saint-Viteux, an ambient soundsculptor based in Belgium. "Every Moment Of Light And Dark" CD album is out since December 2015 on Norwegian UAE Records as a follow up to his debut CD EP "Wolves And Horses", which was released on the same label in May 2015. The album is packaged in a very nice 6-panel digipak designed by the artist himself, additional credit goes to Ultimae's Vincent Villuis for his mastering duties. Although it took me nearly two years before I was able to explore Wolves And Horses, I was strongly fascinated by Christian's deeply embracing and poetically immersing aural and visual driftscapes since the very first day of my encounter. "The Sand In The Hourglass", at 3:32 the shortest piece on the album, reveals this powerfully engulfing journey with gorgeously sweeping waves, permeated by glitchy reflections and warmly evocative piano glimpses. "Crossing The Last River" delves into profoundly graceful, panoramically cinematic and perpetually tiding expanses, again reinforced by sparse, yet mindful piano traceries, intricate organic solitudes and intangibly glancing enigmatic voice/crowd samples. Pure beauty!!! "A Place Between Heaven And Earth", with 8 and a half minutes the longest track on this ride, keeps safely on the path, where tranquilly floating horizons commingle with intensely nuanced wistfulness and stubbornly sequenced balmy motifs. The next tune, "The Infinite Meadows Of Heaven", shifts into heart-warming, yet nebulously infused realms, here and there augmented by gently outbursting fragments. Colossally majestic "My Soul Is A Dark Forest" is driven by hazed female ethereal chant magic and memorable moments from my sonic explorations during the second half of the 80's are resurrected once again. So it is with the following, enigmatically engrossing masterpiece "Like Ashes In The Wind", which authenticates some important influences for Wolves And Horses. "The Death Of Joseph Wayne", as indicated by its title carves deeply elegiac sceneries with mildly crescendoing organic tapestries. Part 1 of "The Walls We Build Around Us", which clocks over 8-minute mark, unfolds with nostalgically panoptic blankets, while the second, 6 minutes long portion moves into more tensely undulating domains, continuously imbued by introspective time-lapses. The closing track, "The Limits Of Nothingness", drifts into ambiguously fragranced spheres magnified by cyber-biotic infusions with inconspicuously ascending piano subtleties. A very strong finale! 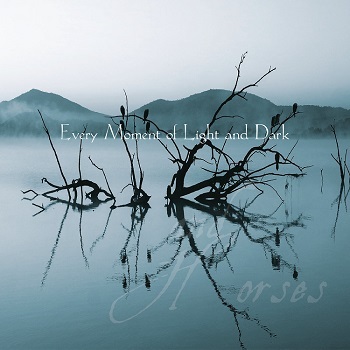 Although I could imagine slightly cleaner sound quality with broader dynamic range, "Every Moment Of Light And Dark" is undoubtedly a truly impressive recording by Wolves And Horses fastidiously amalgamating enveloping tenebrous stratums with nectarously soothing heavenly pillows, and meticulously conjugating sonic, cover art and lyrical expressions. No wonder, as far I know digital painting is another hobby of the sole creator behind Wolves And Horses. Constantly rewarding 64-minute listening experience awaits here, bravo, Christian!!! So it's quite obvious I highly recommend also already mentioned "Wolves And Horses" CD EP. And last but not least, the newest album "Earth" is in the works, still unknown if on a label or as a self release. In any case, I will keep a focused ear to the ground.